Joop! Femme (Eau de Toilette) is a popular perfume by Joop! for women and was released in 1987. The scent is floral-oriental. Projection and longevity are above-average. It was last marketed by Coty. More mustard! But good mustard! It's just that I saw the scent right in front of me and thought, "What the hell! Just give it a try, even if the whole world should know this scent here except for you". That's what you see according to the many commissioners on the scent here. Yeah, so what? I was just tiny small and just a few years old when this fragrance appeared (yes,... I was sweet there too, as a tiny guy... *sigh* what I've only become of myself?...)! Well, of course I try to stay objective, Joop is not one of my favourite brands. Well, I thought the thrill for men was quite nice, but otherwise I wouldn't necessarily howl if there weren't any Joop fragrances anymore, but hey, that's all a matter of taste. So, as I said, I'm now coming to Joop! Femme, which is probably now considered a classic among fragrances. The fragrance begins with aldehydes, roses, sweetish jasmine and neroli and a few minutes later with oak moss. This makes it immediately clear that it is like an almost typical fragrance of the past, since I think that many women's fragrances from the 80s went in this direction or were still worn in this way, especially in the 80s. Anyway, there are of course a lot more scents available, but first of all they don't smell as strong as the scents listed above and secondly they are even more interwoven, so it's more difficult to identify them 100%, but let's see how it will be later. The roses soon become stronger, the neroli also, jasmine seems to remain the same, and now there are also light, fruity notes, but more in the background. Later, however, you can smell the jasmine better, this is because the roses weaken again sometime, and I think the aldehydes are not as strong as they were at the beginning. Because besides the jasmine I later smell especially neroli and fruity notes well, in addition there is something woody and patchouli. And the smell is also horny! Hey hey, animalistic like beaver horny, you'll notice that more and more. By that I mean the Zibet, which may not be so popular with everyone, but it is not so much disturbing now, so you can live well with the Zibet, at least in this fragrance here. And if you also don't like oakmoss so much, I can reassure you that oakmoss also gets weaker faster. The sweetness of jasmine is increasingly replaced by vanilla towards the base, making the fragrance more powdery and slightly softer. An additional sweetness comes from the amber and I think that amber and vanilla smell really great together. Otherwise, the fragrance becomes softer and softer and remains in the later base. Noise! Buzz! Bang! Uh.... Okay bums sounds a bit "wrong"... :D I meant of course with these terms that the Sillage is a real firecracker. It is room-filling and can be smelled for a while at a distance, and probably it was even stronger at that time! With such fragrances one expects an enormous durability right from the first sprayer and is not disappointed here either. The fragrance lasts very long, so it remains on the skin for more than 10 hours. Probably longer. Okay, the bottle is my real criticism of this fragrance here because it's just too simple and doesn't really look good in my opinion. It's just a container of yellowish scented liquid with a big Joop! inscription and a milky lid. There are much more beautiful flacons and I think that Joop has never had particularly beautiful flacons ... yes yes stonigt me! Guuuut, I admit it. This Joop fragrance belongs to the well-done fragrances of this brand. It smells a bit old-fashioned and therefore a bit more mature, but it's still good, even if I personally don't like all the scents, especially I'm not a fan of civet or oakmoss. But that doesn't matter, because you like the overall composition and, as reported, these two scents also weaken more and more. Since I already mentioned the term old-fashioned (and not omahaft, that's a difference! ): Yes, the fragrance reminds of other known fragrances of his time or fragrances that were still very popular in the 80s, such as Shalimar or No.5, to enumerate some well-known fragrances of their time. Oh yes, to clear up misunderstandings, I say again that I mean that Joop! Femme goes in the direction of the fragrances mentioned, in terms of style, and not that he would smell like these fragrances. Even if I personally should like other scents much more, I recommend nevertheless times to a test, above all with the favorable price! Simply one of most feminine scents out there, despite having been out there for decades. It's love or hate, for it won't take prisoners. But I yet have to found a man who dislikes it, or a woman who does not like it on another. Sensual, evocative, exotic, it's alluring and provocative without being vulgar. Suits best more mature women than young, for it is a complex fragrance. Note: over the years I realised that this type of scent reacts best with an alkaline PH - it works best on people with cold and dry skin, such as myself. This is wonderful. I loved it way back when I was much younger than nowadays, and I still love it today. If I should ever be so lucky to walk down the aisle one more time, it will be with Joop Femme on me. She is so feminine, in a very sweet way. Not a femme fatale, not alluring, but still super enticing and romantic. She is not a love potion, but a frag you want to wear for a romantic stroll on a beach promenade in the night, lanterns lit and holding hands with the man you love. It puts my man in a "love to care for you" mood. You know, like someone lovingly wipes a strand of your hair out of your face before kissing you gently, or helps you into your jacket and then places a tender kiss onto your cheek. Somehow it evokes the care bear in the man I love, and that makes me love Joop Femme even more. I have loved this darling for years and years. Had no idea until I looked up notes for an oriental sniff fest that it was a proper oriental. Wolfgang Joop is the designer. When Joop! Femme first came out I was often in Germany, his country. German friends may have steered me to the fragrance, because I recall buying my first bottle at an airport duty free and having to replenish it in that way when I traveled. It wasn’t yet on sale in the USA. I must have gone through quarts of this. Sniffing it now and comparing it to the oriental grand dames, I immediately detect the difference. Joop is best-suited to the daytime, more boardroom than boudoir. This is due to its heavy use of woods, yet the oriental notes and lush florals keep it feminine and luxurious, just not overtly sexual. To me, this is still a knockout fragrance—less complicated, more straightforward than its exalted peers, yet a stunner nevertheless. I feel like patting myself on the back for picking it as one of my signatures during the years when, “I am woman, hear me roar,” was still a brand new thing. p.s. Just watched the video linked here for Joop. No idea what it means or why the music is E Lucevan Le Stelle, sung by a doomed man remembering a passionate encounter. Actually, the music makes more sense than the video, set in a desert. Weird. I was randomly choosing a mini to wear and my eyes fell upon Joop edp. I had forgotten how nice this perfume was. A classic powerhouse of the late 80's. 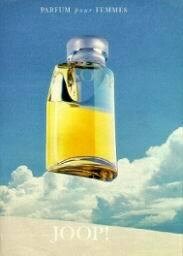 A tiny dab produced a powerful burst of aldehydic neroli citrus and rosy florals rapidly backed up by the solidarity of that familiar sandalwood/civet/musk/patch/amber that was the main backbone of many of those 80's frags. There is a tonka sweetness too that nicely rounds this perfume and stops it being too jasmine floral. I would place this in the sweetish amber zone. There is a hint of spiciness that keeps it interesting and then the lovely soft drydown of a powdery amber style fading right down to a mere soapy trace. One of those neck nuzzlers for later. The civet isn't scary in this, just a balanced ingredient. However, this needs an extremely light hand upon application. A tiny drop on one hand and that is plenty to smell. This is the sort of perfume that forms those huge wafts of lingering fragrance long after the owner has passed by. An 80's style generous application would be sickly overkill. An all round well constructed fragrance with a superb longevity. Guerlain lovers may like to try this as it has that type of soft, sweetish, guerlainesque shalimar woody tonka-ism. This is a big 80's floral oriental along the lines of Ungaro's Diva and Scherrer 2. Wear only if you dare! I happen to love this sort of fragrance, it's complex, confident and very well blended. You have to like your civet BTW, so if Bal a Versailles doesn't scare or repel, give this a try. Behind this boring, uneventful looking bottle lies a fragrance so captivating and beautiful that you'll wonder how Joop! managed to advertise this fragrance so poorly. This is a floral based scent, and a rich one at that. 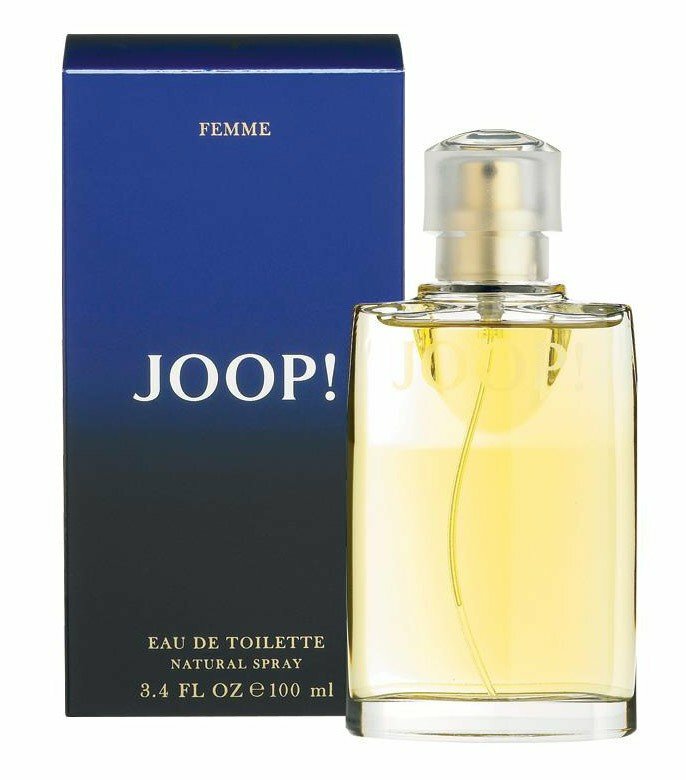 Creamy and somewhat mysterious, Joop! Femme is everything a scent should be. Strong in the opening, the aldehydes and coriander create a powdery and slightly spicy scent which is complimented by the subtle citrus and fruity notes. The heart of this fragrance gives way to luxury. My nose was met with delightful musky and powdery florals, the jasmine being most dominant. I do believe that white floral lovers will enjoy this fragrance whole heartedly. There is a strange yet likable smokiness which lingers throughout this fragrance's composition. I really enjoy this aspect however I'm not certain as to what note brings it about. The base notes are beautiful. The tonka bean, patchouli, vanilla, cedar and civet make a very pleasant and intriguing olfactory experience. You don't need to spray much of this to make it last. The lasting strength is worthy of my praise. I do recommend.